EFIP is very excited to organise its 2018 General Assembly in Seville, hosted by the Port of Seville. Can you tell us more about the Port of Sevilla? What are the main characteristics and challenges for your port especially looking at the transition towards 4.0 logistics and in becoming an energy-neutral port? The Port of Seville is the only inland seaport in Spain, being the waterway from Seville to the coast. The seaport is exceptionally situated in southern Spain's main metropolitan area with a surrounding population of over 1.5 million and it boasts intermodality based on ideal connections between ship, train and truck within the public port facilities. Research, Development and Innovation (RD&I) has been amongst the key elements providing added value to the port. The path to becoming a technology port runs through the application of new information and communication technologies in port management. In this regard, the port authority has taken its ﬁrst steps with the Tecnoport2025 initiative, which follows the Tecnoport2015 project that was completed in 2015. Tecnoport2025 is a project developed in partnership with the University of Seville as a pre-commercial public procurement project centred on 3 areas: CUTS (a geolocation and remote platform for containers), FPS (a system for operating railway), and eRIO (an information platform for rivers). In view of Tecnoport 2015, a first implementation of the RIS standard was made. One of the conclusions of this project was the need to improve in three aspects: the safety of navigation, the capacity of the waterway transport, and the environmental protection. Advanced environmental monitoring, especially the height of the waves and their impact on the waterway margins. For these three technologies, the deployment of a corresponding pilot located in separate parts of the Euroway is proposed. These pilots will be integrated in the ICT infrastructure already existing in the Port of Seville, this also being one of the objectives of AIRIS-PS. The Port of Seville is currently immersed in a process of a far-reaching transformation to bring out the logistic and co-modal potential of the port-logistics community of Seville. The proposed action, called FSPII, is part of a Global Project to improve rail operations in the port area through the implementation of new technologies and innovative technological and organisational systems, creating an optimal logistics node, thanks to the time and cost saving and the improvement of the interoperability and efficiency of the network. An increase of the port's competitiveness. In addition, the Port Authority of Seville is working hard to become an energy-neutral port, developing a project within the port based on renewables energies (biomass, solar or wind power) and promoting the energy efficiency. Could you tell us more about the perspectives and opportunities that a stronger hinterland connection could give to you, the Region and the EU? The Port of Seville is strategic for Europe, as it constitutes a primary logistics hub in the Core Network and pertains to the Mediterranean and Atlantic railway corridors of the Trans-European Transport Networks (TEN-T). Creating a place of opportunities for industrial and logistics investments. The open session of our General Assembly meeting on 16 March 2018 in Sevilla focuses on the theme: “The strength of seagoing inland ports, crucial interfaces between the maritime and hinterland leg”; how do you benefit from this geographical position between the maritime and hinterland leg and what is your strength in comparison with other types of ports? Strategic port for Europe: Node in the Core Network of the Trans-European Transport Network. Today we should recognise our potential as an inland seaport, similar to the recognition we received from the European Commission, who referred to us as a strategic port, or the companies who have made a long-term commitment to the port enclave. This means that we currently have solid economic, commercial, logistics and industrial foundations in the region, and that our prospects for the future are highly promising. This is an impetus to continue working to provide a quality service that brings added value to business networks and generates wealth in our communities. The Port of Seville is one of the main intermodal centres in the south of Spain and aims to maintain its competitive geographical position in the future. Could you tell us about crucial planned infrastructure projects and works will support this ambition? As an inland seaport, it is vitally important for Seville to optimise accessibility. In this regard, the port authority has made investments to adapt its infrastructures and maximise eﬃciency in the passage of freight. The waterway runs 90 km along the Guadalquivir Euroway to Seville. Given the hydrodynamics of the estuary, there are certain areas in the channel where sediments in suspension settle and can interfere with the entry into Seville by sea. For this reason, the port authority promotes accessibility to ensure maritime traﬃc to the port. In October, the port authority began the 2017 Guadalquivir Euroway maintenance dredging campaign to maintain the bottom depths at 13 points in the waterway without surpassing the maximum depths in each section. This engagement was carried out regularly in the past to improve navigation and guarantee safety in the maritime access to Seville. Land accesses are as important as maritime accesses to the Port of Seville. The 2000-2020 Master Plan entails a series of engagements (listed below) for optimising accessibility by road and railways between the port and its hinterland. Closure of the railway ring and linking of the Port to SE-40: in 2016, the Connecting Europe Facility Coordination Committee approved European funding for the project to close the railway ring and the link the port to the SE-40. This construction work package entailed the closure of two rings: the railway around the edge of the port and the internal port roadway. Seville is Andalusia’s largest port for railway traﬃc with over 20 trains running weekly, shipping freight 24x7. In light of this, the port will intend to reinforce its internal railways by building a 4 km branch on the Cuarto Dock to maximise the railway infrastructure performance. This thus connects the entire perimeter, linking the present lines with the mobile railway bridge on the Puerta del Mar lock. Regarding the closure of the internal bypass, the work included the construction of the new port access to the SE-40 expressway running from the bridges of the new lock and linking it with the future connection of the bridge over the Guardaira river. A total of 4.6 km in roads will be built. The resulting reduction in traﬃc on the SE-30 is estimated to be between 3,000 and 5,000 lorries daily. New railway access to the port: the port authority has been working on the project for a direct railway access to the port (La Salud Junction). 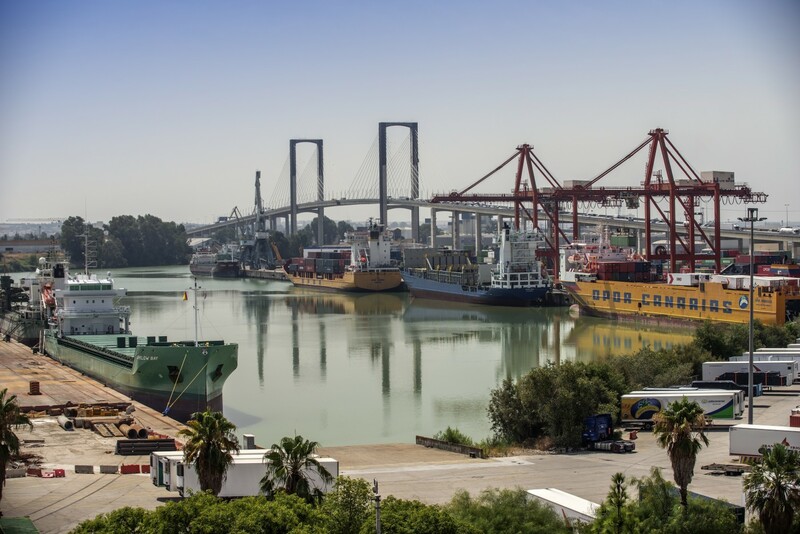 This engagement will provide Seville’s port with a direct access for freight rail traﬃc without having to pass through the La Salud Station, thus favouring land connections from the port and optimising logistics even further. Railway transport will thus beneﬁt in terms of competitiveness and eﬃciency, and train passage time will reduce. This is an essential project for Seville, since freight trains that presently want to access the port must pass through the La Salud Station and manoeuvre back to reach the current railway access.